This blog, initially aimed to be an online environment documenting design, typography and visual culture around the Arab world, will be dedicated in the next couple of month for the online course I will be giving in collaboration with UNESCO. 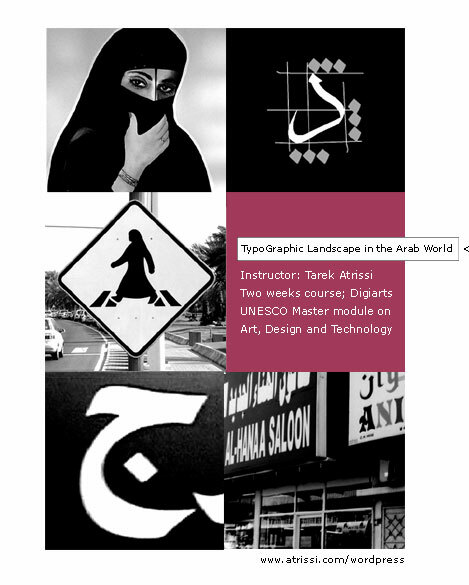 The course is entitled “Typographic Landscape in the Arab world” and is given as part of the Masters Module on Arts, Design and Technology organized by DigiArts / UNESCO. The course will emphasis on typography and environmental typography from around the Arab world: previous postings and postings that will follow this message will all be relevant in one way or another to the general theme and objectives of the course. Three documents are presented for review by students at the beginning of the course: 1) General information about the course 2) Detailed syllabus of the two weeks course / project for students 3) general resources document [linking basically to this blog site].